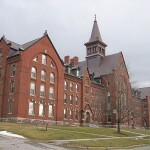 Macdonough Hall at SUNY Plattsburgh is reportedly very haunted, say witnesses who have heard toilets flush and radios and fire alarms turn on, seen strange apparitions and bathroom lights that come on and off, and found locked doors unlocked. The hauntings are believed to stem from before the hall was built on the marshland that once stood here. In 1949, construction workers turned up the bones and headstone of “wife of Benj. Vaughn and daughter of Nathan and Rosann Averill. Died Dec. 12, 1812, age 47 years.” Another grisly tale about the hall says it was built by a wealthy family who intended to sell it to the college. The family’s old butler, Mortimer, had some mental health issues and killed a young girl in the house, hiding her body in the attic. This is how students explain the ghostly sounds of a screaming girl or a man laughing heard here on occasion. However… Michael Duane of the class of ’80, now a tax attorney in Pennsylvania, admits to making up and telling this story to freshman, who have perpetuated the rumors. Still, many swear that there are ghosts that are not works of Duane’s imagination in Macdonough Hall. two good friends of mine went here in the late 80’s and there were no gohost sotries or hauntings going on. they told me about parties and the like and knew of my interest in ghosts so it would have come up if the stories had any validation if only as a way to get me to visit. I lived there 1979-1983 Fire alarms all the time with no know cause, toilets flushing with no around shrinking sounds there was a bomb shelter under the residence that strange sounds came from. I believe in the existence of ghost and the paranormal but also try to offer possible normal explanations. Fire alarms sometimes malfunction but I wasn’t there so idk. Also being college its possible something was flushed down a toilet and makes a whistling/ “shrieking” sound. I had a small tooth brush go down once and the toilet made a shrieking sound every time after it was flushed. Again, I do believe but just offering a possible explanation. It isn’t just Macdonough Hall that is haunted – it’s the entire campus and beyond into the city that has a darkness over it. What I experienced during my year at SUNY Plattsburgh while living in Adirondack Hall was so bad that I still get scared talking or even writing about it. It was to the point where I had to urgently get a priest to bless my dorm room, and while the blessing definitely helped, the malevolence directed against me took other channels that didn’t end until I permanently left the college at the end of the year. In fact, the strong oppression I had been feeling since I returned to campus that January only lifted after my family’s car crossed the town line.